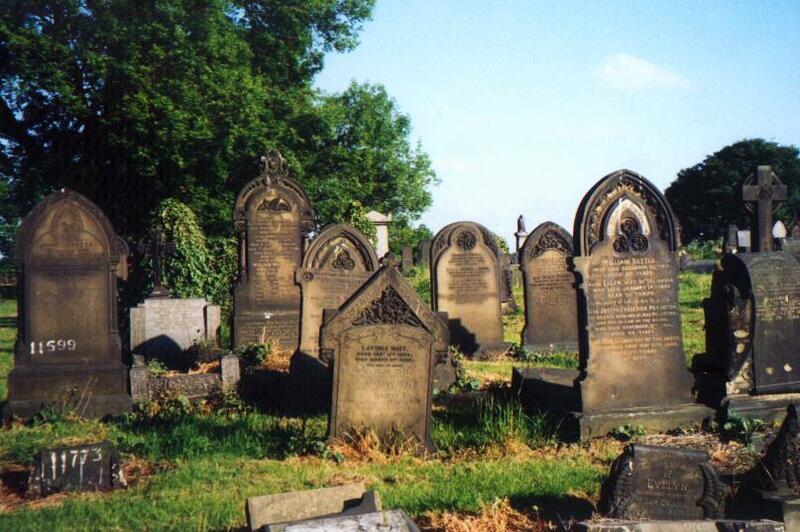 Did you know that a Victorian World Champion swimmer is buried in Holbeck cemetery ? Evan Thomas Jones, who was born in Holbeck, died on 3rd March 1904 aged 54 years. By the death of E.T. Jones which occurred in Leeds yesterday one of the old schools of professional swimmers disappears, the successful rival of J B Johnson, W Beckwith , James Finney and Arthur Robinson. At one time Jones was recognised champion swimmer of the world . On August 3rd 1874 he won the mile championship in the Serpentine , London and in 1876 he was the victor in the 1000 yards race in Waterloo Lake at Roundhay Park, covering the distance in 15 minutes 56 and 1/2 seconds . Twice in 1876 and three times in 1877 Jones repeated his victories over the Thames championship course and on the last occasion swam the mile in 25 minutes and 22 and3/4 seconds. In 1881 he beat W, Beckwith in the 500yards championship at Roundhay, and some years later defeated James Finney in the same championship. More recently Jones was for a time swimming instructor for the Leeds School Board and was very popular with the boys. The Yorkshire Post 4th March 1904 also has a report. We regret to have to record the death of E T Jones of Leeds, ex-champion swimmer of the world, yesterday which took place at his residence in Leeds at about five o’clock yesterday afternoon. He had been lying ill for many months , suffering from consumption. Jones was in his fifty-fourth year , having been born at 4 St. John ‘s Place, Holbeck on May 7th 1850. He stood almost 5 foot 5inches in height and his swimming weight , when in his best form was 10 stone. In his day Jones met and defeated all the best men at varying distances , and was without doubt,the best man the world had ever seen up to his own time.He won the mile championship in the Serpentine on August 3rd 1874, and, on September 12th of the same year he won again over the Thames Championship course. In 1875 Jones was again successful in the Edgbaston Reservoir, Birmingham and in 1876 he won the 1000 yards race in the Waterloo Lake, Leeds swimming the distance with two turns in the remarkable time of 15 minutes 56 and 3/4 seconds. Twice in 1876 and three times in 1877 Jones repeated his victories over the Thames Championship course , and on the last occasion he swam the mile in 25 minutes 2 and 3/4 seconds . On September 3rd 1881 Jones defeated W Beckwith of London in the 500 yard championship in Waterloo Lake . In the same lake some years later , Jones defeated James Finney for the quarter-mile championship, and this, we believe was his last championship performance .Jones’ last money match was against J Maddock , Leeds in Union Street Baths, Leeds in December 1897. The distance was 100 yards and Jones won cleverly. It is hard to believe today but the simple act of swimming was once a major professional sport.This sport was cold-water swimming or white-water swimming , as it was known in the USA. In the late 1870’s and 1880’s professional exhibition swimming and endurance races were popular sporting events with high purses, heavy wagering and stiff competition more on a par with professional wrestling and boxing or Las vegas stunts than amateur sports. Swimming was the new phenomenon in the 1800’s , gaining so much popularity that a Swimming Society was started in England in 1828, which led to heated swimming in public swimming-baths where the professionals produced feats of speed-racing and endurance for spectators. The term ‘professional swimmer’ or ‘professor of swimming’, referred to many activities, and provided a full time occupation for most of the swimmers . Most of the champion or professional swimmers were interested in competing in swimming events to earn money.As the ability of swimmers increased , the need to train regularly became essential and the policy of most baths was that they only permitted the bath superintendant to teach swimming. This meant that professionals such as ET Jones had to find this employment if they wished to compete and teach successfully. The weekly wages for a Baths Supervisor in Liverpool in 1856 was 40 shillings (£2) but for a baths attendant the wages were only 24 shillings (£1.20)But usually these men were laid off during winter months when the baths closed . So it is no wonder that swimmers wanted to earn extra through competing and promoting popular ‘aquatic shows’ , which attracted as many as 4000 people in 1840 at the Mount Street Baths, London . One very famous swimmer was Captain Webb who used to feature on boxes of matches.He went on to write a book entitled ‘The Art of Swimming’. Lambeth Baths in London was the site of the 1879 ‘Trials of Endurance’ where literally the winner was the one who covered the most distance in 6 days ( 145 hours of swimming! )Webb was the only swimmer who persisted in the breast-stroke rather than the newer ‘sidestroke’ and he won the Champion of England title easily by swimming 3522 lengths or 74 miles. Winners were offered prize money of £70 which was a considerable sum in those days and well worth all the effort. NOTE: The next gravestone to ET Jones is also in memory of a Jones family but this was a mustard maker – another interesting fact about Holbeck Industries ! !